Confessions of a 20-something Scrapbooking Mother: Changito Happy Mail!!! Aren't they the cutest? I am crazy about that little monkey! I love the Christmas ones! Maybe they will help me get going on my Christmas cards... These were sent to me by one of my favorite bloggers, whose name also happens to be Becky! ;) Go check out her blog here. She is so talented and super nice. Her work is stunning. Be sure to go check out her blog, you won't be sorry! 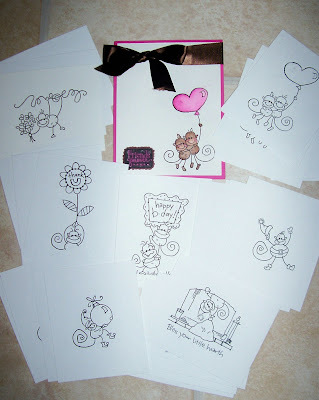 I can't wait to color these and make some cute cards. Thanks so much Becky, you're the best! This was a great pick-me-up!! Well, thats all for now. Aaron and Alana (the little girl I watch) both fell asleep watching Nemo, so its just me and Alex! I think I'll take this time to catch up on my TV shows and have a nice cuddle in. Have a great day!! Happy mail is the best! Oh, Becky is wonderful! She's one of my SBS2 sisters, and she's just amazing, kind, and so very sweet!! Enjoy your cuddle!! You are most welcome, Becky! I hope they put a smile on your face and in your heart! Can't wait to see all the fun stuff you do with them.